Way back when (sometime in December), I showed this group of knitting projects. I don't often work on this many knitting projects at once but Christmas was coming. Two of these projects are now complete and delivered to the recipient. 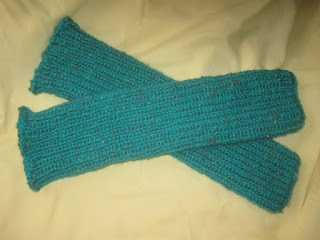 This photo is fairly close to the true colour of the yarns. These legwarmers (same as the ones on the left in the previous photo), made with Shetland chunky yarn, are now keeping my eldest daughter Laila's legs warm. She was wearing them just a couple of days ago when I was talking to her on the phone and she mentioned how warm they were. The yarn came from my stash. 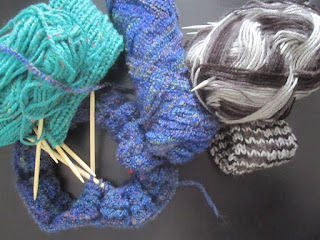 I have lots more chunky yarn to use up. 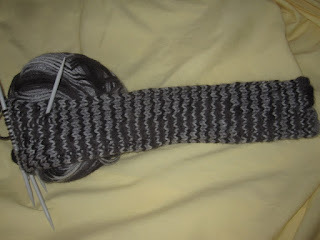 Variegated yarn, Patons Decor, was the beginning of another pair of legwarmers. 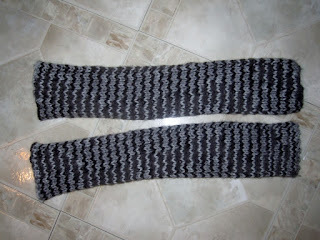 The finished pair. Completed just in time for our 'second Christmas' this past weekend when our youngest daughter, Ayla, came over from England. I asked her to model them for me before she left to go back home. I'm still knitting when the mood hits me. I have that one sweater to sew up still. I will finish it this week - I hope. Sewing for little people will be keeping me busy for a while. 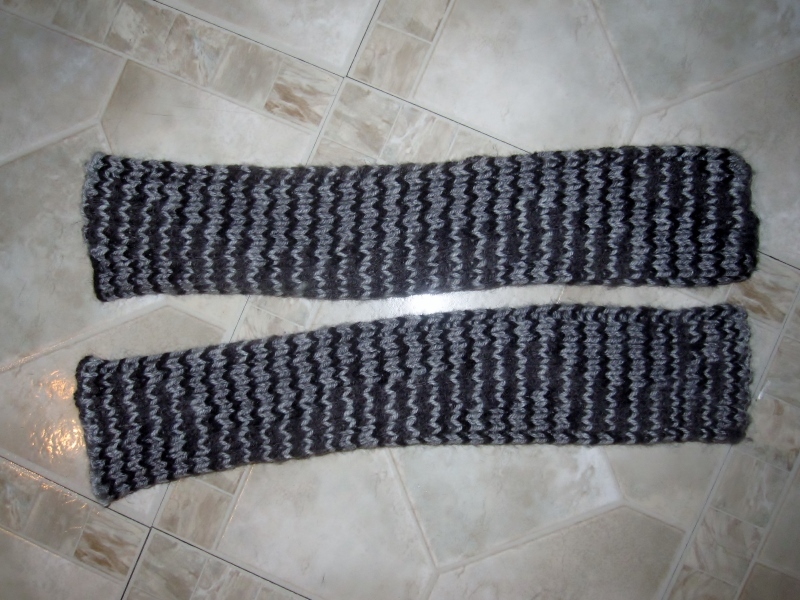 Knitting is so soothing on cold days, and to see the finished leg warmers , and modelled, wonderful..
Two finished projects already! The sweater is more work, it must be more than twenty years since I knitted something that big. The baby cardigan for our grandson two years ago was as much work as a pair of grown up's socks so it doesn't count really. 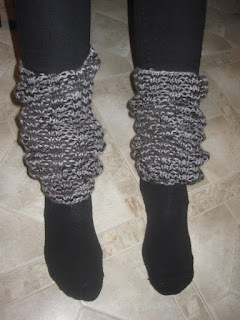 I miss leg warmers - I used to wear mid-calf length skirts to work, and I would keep a pair on all the time! Pushed up though so you couldn't see them. They made winter bearable! Really pretty, Dolores!